Here is my current build, I built it in November of last year. I've been having trouble since day 1, I believed it was the graphics card at 1st, because randomly during games, my screen would go black and my monitor would lose signal. Sometimes the picture would come back, sometimes I would need to restart my machine, other times my machine would just crash. At one point, my machine was blue screening after Windows booted up. I tried to reinstall Windows, but it was even blue screening during the Windows installer. I was finally able to reinstall Windows once I disabled XMP. Can anyone help me? I hate using the machine with XMP turned off, there's a noticable drop in performance whilst gaming. A couple of things you can try here. 1: Check that your BIOS is the latest version for this motherboard. (F23) If it isn't then I would update to this version and see if that solves the problem. 2. 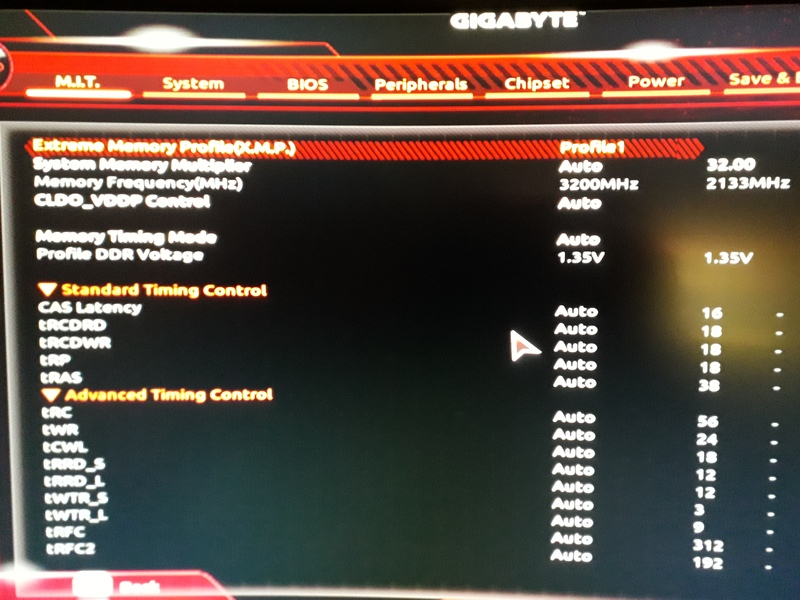 Manually set the timings in BIOS rather than using the XMP profile. This will give you the correct settings and speed of the RAM anyway and would be the same as using the XMP profile. I've tried to put in the settings manually, just taking pictures of the XMP with my phone. But when I change my "Memory timing mode" to manual, it still doesn't let me change the "Profile DDR voltage"
What BIOS version does your motherboard have? Use the "Page Up/Page Down or + & - " keys to alter settings. I have the latest BIOS, F23. If I change my profile at the top to none, it lets me change settings. But if I change "Memory Time Mode" to manual. The voltage setting below stays greyed out and I still can't changed. I've been trying the EZ Overclocking settings for DD3200, worked fine for 2 days, but it just crashed on me. I just had a look at the supported memory list for Ryzen on my board. Is there somewhere I can go to see the settings/timings I can manually put in to get my RAM to run at 3200?